Here�s a chilling scenario for you: you find out that not only is your wife the casualty of a suicide bombing, but is also the primary suspect responsible for the attack. 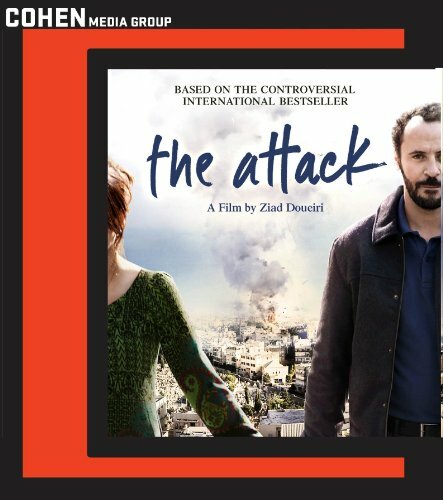 That�s the premise of The Attack, the new feature by filmmaker Ziad Doueiri, best known for his work with Quentin Tarantino on his films Reservoir Dogs, Pulp Fiction, and Jackie Brown. This extremely powerful, moving film takes its beyond-intriguing premise and runs with it, capturing the perfect amount of tension and surprise that it implies, and earning every one of its critical accolades and awards garnered on the film festival circuit. The Attack comes to Blu-ray courtesy of Cohen Media Group, and this disc packs just as much punch as the film itself. We meet Amin Jaafari (Ali Suliman) as he�s about to receive a prestigious medical award for his work as an Israeli Palestinian surgeon. Right before he�s introduced to the crowd, Amin receives a call from his wife, Siham (Reymonde Amsellem), whom he quickly cuts off due to his need to take the stage. The next day, there is a suicide bombing near Amin�s hospital, and he operates on many of the victims, saving lives where he can. It�s that evening where his life changes forever, as he gets a call to return to the hospital immediately. Once there, he identifies (the half that�s left of) the body of Siham, who not only perished in the blast, but is the primary suspect as the actual bomber. In search of the truth, Amin sets off to retrace Siham�s steps, convinced that in doing so, he�ll prove her innocence. If you, like Amin, are looking for a bunch of answers, The Attack does enough to leave you satisfied, while at the same time, leaving plenty of unanswered questions on the table. Such ambiguity is to the film�s benefit, as such an ending makes it easy to forgive a rather soft, uninteresting midsection, and leaves us to ponder what we believe is the truth, in turn, allowing The Attack to stick in our minds for years to come. The main question of Siham�s innocence or guilt is, in fact answered, but it only raises more questions, which virtually command repeat viewings. Doueiri�s powerful direction, and the wonderful performance of Ali Suliman (Lone Survivor, Body of Lies), make such a prospect a more than welcome one. The Attack appears in its original 2.40:1 aspect ratio and it looks fantastic thanks to this 1080p transfer. Shot digitally, things are consistently crisp, with the wonderful-looking locations standing out as particularly easy on the eyes. The colors are generally drab, but, given the movie�s themes, and somewhat shady set pieces, this isn�t a surprise, nor does it take away from the natural look of the proceedings. The audio is a DTS-HD Master Audio 5.1 track that isn�t asked to be very dynamic, as much of the film is dialogue-driven. There are times where the music and light action brings the surrounds and subwoofer to life, but, for the most part, we�re engaged with crystal-clear dialogue throughout. Other than a photo gallery and the film�s trailer, the only other extra is an interview with director Ziad Doueiri. During this four-minute piece, the filmmaker speaks briefly about how he first became aware of the novel that the film is based on and how he was surprised that an American film studio wanted to tackle such a controversial story.